Editor's Note: The various comments, rules, etc. that follow are those published in 1980 and are not valid today with the Australian Hibiscus Society Incorporated although many will be largely unchanged. They are printed here to be historically accurate to the original publication and to provide notional comparisons with what happens today. This nomenclature covers the varieties commercially grown in Australia. Obviously there are some I would have missed, due to lack of forthcoming information. There will be a supplement to this nomenclature each 12 months. If information comes forward on any varieties missed, it will appear in the next supplement. At the rear of this nomenclature there is a list of registered names ot Australian seedlings either undergoing trials or with insuffucient information available for inclusion at the time of printing this book. Those acceptable will appear in the next supplement. There is also a list of commercially inactive varieties. If, or when, any regain popularity, they would also be included in further nomenclature supplements. The page numbers are of interest only as they reflect the original publication but the URL's link to the sections on this site where the content may be found. Origin Abbreviation of Varieties in Nomenclature Readings. 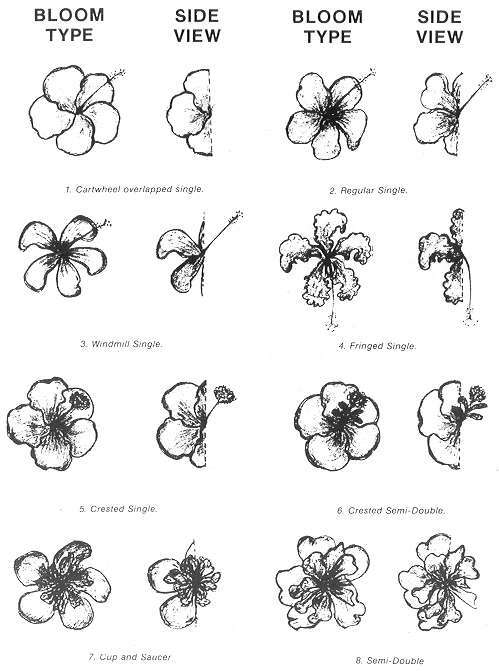 Descriptions - Definitions - Functions of a Nomenclature Committee - Bloom Types for Nomenclature Identification - Bloom Illustrations - Detailed Guide Required by Nomenclature Committee - Leaf Illustrations. This is an attempt to consolidate criteria available on the description and registration of new varieties of hibiscus. It is hoped that by so doing, it will facilitate the work of the Nomenclature Committee and hybridizers, and resolve some of the questions and uncertainties which have occurred in the past. The British Royal Horticultural Society (R.H.S.) colour chart is the official colour reference tor the Australian Hibiscus Society. it is the most comprehensive available at this time. It is recommended that each interested person has a chart available for use. Charts may be purchased by contacting the Royal Horticultural Society, London, England. SIZE:- Sizes listed should be AVERAGE, as obtained from average garden grown plants, during normal warm weather. COLOUR:- The colour also should be taken from a normal first day warm-weather bloom, grown under normal, average conditions in natural light. The following is a list of terms used in nomenclature, and their definitions. 1. RUFFLED. Frilly, ruffled edges on petals or foliage. 2. TUFTED. Small upstanding creases in side edge of petals. 3. PUBESCENT. This term means hairy. It can occur on the reverse or face of a leaf, or both. Also on blooms. 4. CRIPPLE. This term refers to a bloom that will occasionally have a wide separation or distortion in the base petals thus interrupting their symmetry. 5. SELF-COLOURED. This means simply that the portion of the bloom referred to is the same as the main colour of that bloom. 6. OVERLAPPED. Petals lap over one another. 7. OVERLAYIOR OVERLAID. Refers to colour that appears to be laid over another more pronounced colour. 8. STIGMA PADS. The small velvety, coloured pads on the tip of the staminal column. 9. STAMINAL COLUMN. The long column below the stigma pads extending to the eye zone of the bloom. 10. ZONE/EYE ZONE. The area at the base of the staminal column. 11. CENTRE. The area at the base of the staminal column and forming a distinct, defined area of colour. 12. SWIRLED CENTRE. The area at the base of the stamina[ column and forming a distinct, defined area of colour but giving a windmill appearance. 13. HALO. The area on the outer side of a centre and forming a complete circle around the centre. 14. FLAT. Applies to blooms that hold a firm, flat shape. 15. FUNNEL. Having a cone-shaped appearance. 16. INCURVED. Can apply to outer petals of bloom or the outer edge of the leaf curving inwards. 17. RECURVED. Can apply to outer petals of bloom or the outer edge of the leaf curving outwards. 18. LOOSE. Refers to the petaloids of a semi-double or double which are few in number, giving the effect of looseness or openness. 19. CALYX. The part of the bloom immediately below the petal structure, green in colour and made Up of five sepals. 20. EPICALYX. Five bracts below the calyx, resembling an extra outer calyx. 21 SEED CAPSULE. The small, mound-like structure within the calyx where the seeds are produced. 22. LEAF SIZE. The sizes given for foliage are taken from mature leaves. 23. DISTORTED. Applies to leaves with an unnatural look. 24. RENIFORM. Applies to leaves having a kidney shape. 25. CUPPED LEAF. Foliage is not flat, but cups almost in a circle. 26. HETEROPHYLLOUS. 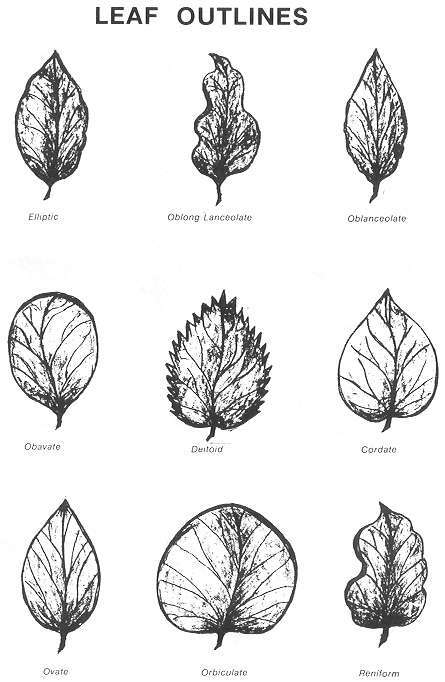 Having considerable variation in juvenile leaf formation on bush (see Leaf illustration). 27. PETIOLE. The stalk or stem of a leaf. 28. MINIATURE. Any bloom that is normally 10 cm (4 in) in diameter or less. 29. RECUMBENT. Applies to branches having a tendency to sweep or lie to the ground. 1. Anyone wishing to register a new cultivar will contact the Australian Hibiscus Society Nomenclature Committee to arrange for them to observe and evaluate its bloom and characteristics. If it is approved for registration, the individual will furnish the committee chairman with written permission for use of name proposed. 2. As there are many names already registered with the A.H.S. Committee, it is essential you check first before putting a name to a hibiscus. 3. Each member of the committee will fill out and sign a copy of the evaluation form available from A.H.S. and supervise the making of, or review for accuracy and completeness, the description of bloom and bush. 4. All copies of the evaluation form, completed description form, the written permission for use of name, and the proper registration will then be forwarded to the International Co-ordinator of A.H.S. 5. Make up, and forward to the International Committee of A.H.S. descriptions of any variety commonly grown in their local area and considered worth while, and which is not currently listed in the Nomenclature list. 1 . No hibiscus cultivar shall be accepted for registration bearing a number rather than an accepted name. 2. No hibiscus cultivar shall be accepted for registration or listing if it bears any name that has ever been used previously, even though the previouscultivar isextinct. 3. No hibiscus cultivar shall be accepted for registration or listing bearina the prefix Dr., Prof., etc. but should be Doctor or Professor in full, not Mt. but Mountain etc., as the former practice is frowned upon by the International Nomenclature Commission. 4. The British Royal Horticultural Colour Chart is permanently adopted as the standard colour authority of the Australian Hibiscus Society. For further information contact The Australian Hibiscus Society. 1. CARTWHEEL OVERLAPPED SINGLE. Petals completely overlapped to tips, giving a circular appearance. 2. REGULAR SINGLE. Petals separated for less than half the distance from outer edge of petals. 3. WINDMILL SINGLE. Petals narrow and separated for nearly their entire length. 4. FRINGED SINGLE. Edges of petals split and fringed. Stamina] column long and pendulous. This type includes H. schizopetalus and its hybrids. 5. CRESTED SINGLE. Basic type may be any of above, but normal blooms exhibit petaloids on top end of staminal column forming a perfect crest. This does not include many varieties that may occasionally show a malformed crest. 6. CRESTED SEMI-DOUBLE. Loose double appearance, with petaloids arising from staminal column. Stigma pads usually present. 7. CUP AND SAUCER. Outside guard petals follow single form. Centre tuft of petaloids all arise from centre and are distinctly separated from guard petals. 8. SEMI-DOUBLE. Loose petal formation with few petals that may be twisted or quilled. All petals form from base of bloom. Staminal column may be missing. 9. FULL DOUBLE. Many petals and petaloids in a tight formation, giving a full ball-shaped appearance. Staminal column usually missing. No flat under petals standing out. Sometimes with 5 florets in centre. 10. DOUBLE. Many petals and petaloids in a tight formation, giving a ball-type appearance on top of a flat circle of petals, which stands out. Staminal column usually missing. 11. FLUTED - HOSE-IN-HOSE. Can be single or double, petals are soft on edges, wave-like. Hose-in-Hose, a layer of flat petals on top of five base petals. (as one flower on top of another). 12. UNCLASSIFIED. Not as any above description -a full description must be supplied. (See illustrations). 2. Has this hibiscus been known under any other name. 4. Origin, if known, and parentage, if known, (e.g.) female first x male next. 5. Size of bloom in centimetres and inches. 6. Texture of bloom:- (e.g.) heavy, medium, light. 7. 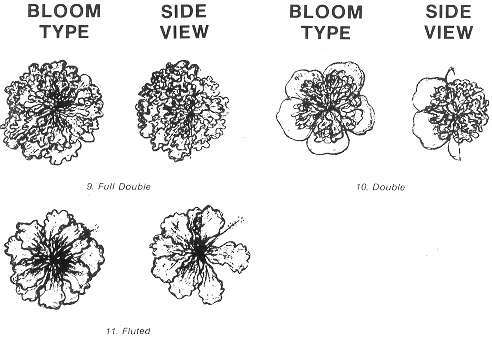 Form of bloom:- (e.g.) fully overlapped, overlapped, partly overlapped, open bloom. 8. Bloom shape:- (e.g.) flat, funnel, recurved. 9. General descriptions:- sheeny, crepey, fluted, heavily ruffled, ruffled, slightly ruffled, highly tufted, tufted, very prolific bloomer, prolific bloomer, fair bloomer, one, two or three day flower, blooms on old wood or new wood, full sun or part shade tolerant. 10. Visual colour:- stigma pads, staminal column, eye, eye zone or centre, halo, to other colours to edge of petals, veins if any, reverse colour of petals. 11. Royal Horticultural Colour Chart description next. If no colour chart available, accurate visual colour description is essential. 12. Whether bloom is:- Uni-coloured (1 colour); Bicoloured (2 colours); Tri-coloured (3 colours); Quadri-coloured (4 colours); Quinary-coloured (5 colours); Hexa-coloured (6 colours); Septa-coloured (7 colours); Octa-coloured (8 colours); Nona-coloured (9 colours); Deca-coloured (10 colours). 13. Holds colour or fades on first or second day. 14. Bud dropper or not. 15. Bush:- Very tall, tall, medium tall, medium, medium/ low, low recumbent. Upright, bushy, caney, woody, slightly woody, woody or slightly woody at base. Very fast grower, fast grower, medium grower, slow grower on own roots, grows well on own roots. Best grafted, grafting optional. Sun or shade tolerant. Colour: Dark, medium or light green. Size: Extra large, large, large/medium, medium/ large, medium, medium/small, small. Texture: Heavy, medium/heavy, medium, light. Gloss: Very glossy, glossy, ordinary, dull. Type: Flat, recurved, distorted, slightly distorted. cupped, slightly cupped, incurved. 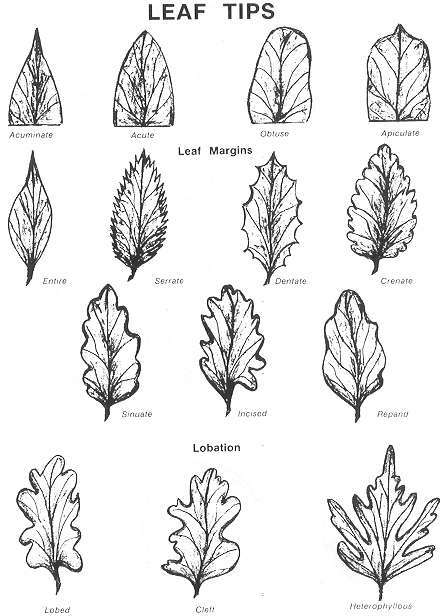 Full Leaf: Leaf outlines, tips, margins, lobation if any. Outlines: (To be taken from illustrations). Leaf Veins: Prominent veins or not. Text, photographs and illustrations by Jim Howie. All rights reserved. No part of this publication may be produced, stored in a retrieval system or transmitted in any form or by any means electronic, mechanical, photocopying, recording or otherwise without the prior written permission of the author. Printed by Prestige Litho Printing Co. Brisbane, Australia.